Even a simple calculation of ROI for many sustainable initiatives proves that “going green” is good for business. The incremental cost of sustainable design and construction is decreasing and energy costs are increasing. Federal, state and local governments are encouraging (to put it mildly) sustainable design and construction. Right now everyone seems to be focusing on the carrots, rather than the very big sticks that they are also holding. Real Estate, like every business, is driven by supply and demand. If you don’t pay attention to the demand for sustainable building, you’re likely to find yourself with a very big supply of empty space. Optimizing energy performance in buildings is a critical element in minimizing climate change, which is why so many government initiatives on the federal, state and local levels are aimed at increasing energy efficiency. However, making buildings more airtight without being vigilant about improving air circulation and reducing the toxins that we introduce into our buildings can have serious consequences for our health. Americans of all ages spend an average of 90% of their time indoors, where the level of pollutants is often two to five times higher than it is outdoors and can be considerably higher. The air in most homes, schools and offices is already not what it should be, and as air quality worsens, so does health. While children are the most at risk (childhood asthma has increased 140% in the past 10 years), good air is important for everyone. Improved indoor environmental quality has been linked to improved productivity, higher test scores and even patient recovery rates. We don’t introduce enough fresh air from outdoors. We fill our spaces with toxic mixes of chemicals, organic matter and dust. Most energy initiatives are based upon ASHRAE Standard 90.1, which governs energy performance. 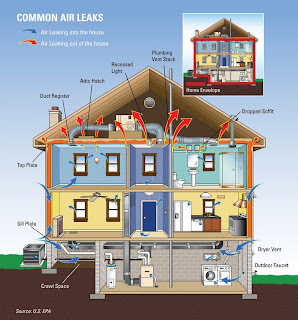 Equally important is ASHRAE Standard 62.1, which governs ventilation. Unless compliance with the second standard is policed, a less than 100% scrupulous building owner could reduce energy consumption by reducing the amount of fresh air for building occupants. Homeowners need to be educated on safeguarding their health and the health of their children as they improve the energy efficiency of their homes. Significant energy savings and superior indoor environmental quality can certainly be achieved simultaneously. But it does require some thought and planning. Sustainable design is often mistakenly associated with certain materials that are very much of the moment, but a classic design that reflects its architectural context and will never go out of style is actually more sustainable in the long term. 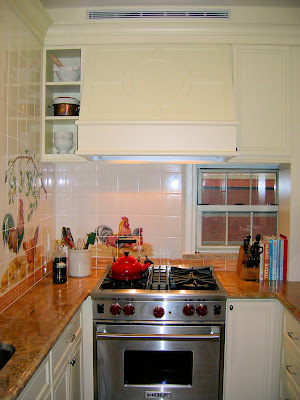 A small kitchen like this one uses less energy and other resources than a large one, but needs to be well designed to function properly. 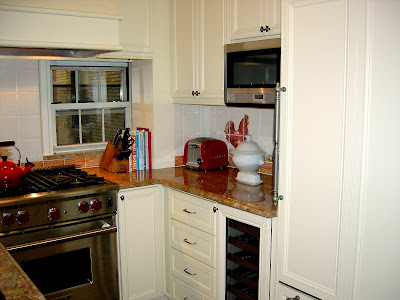 Creating adequate counter space and storage while incorporating a full sized dishwasher, a large microwave and even a wine cooler into an irregularly- shaped 88 square foot kitchen is a challenge even for an experienced design professional. 1. 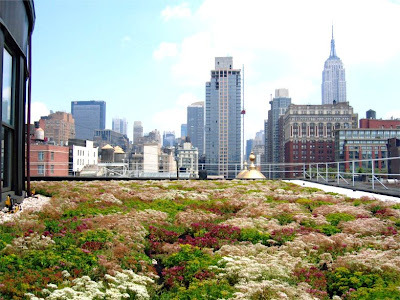 Legislation to create a New York City Energy Conservation Code that is more stringent than the current New York State Energy Code. 2. Legislation that requires owners of buildings that are 50,000 sq. ft. or larger to conduct energy audits and make improvements that can be paid for by energy savings within five years. 3. Legislation calling for buildings of 50,000 sq. ft. or more to include energy-efficient lighting systems when tenant spaces are renovated. Lighting of all areas other than those occupied by residential tenants must meet energy-efficiency requirements by the end of 2022. 4. Legislation that requires owners of buildings 50,000 sq. ft. or more to conduct an annual benchmark analysis of energy consumption and to report the results.